If you find a dead raptor and you suspect that it has been killed illegally (i.e. shot, trapped, or poisoned) then it is best to report it directly to the police on 101, and ask for it to be referred to a wildlife crime officer. They will direct any further course of action, though the exact location and any photographs taken at the time of discovery may be useful. Any problems, then please contact us. If illegal killing is not suspected (e.g. 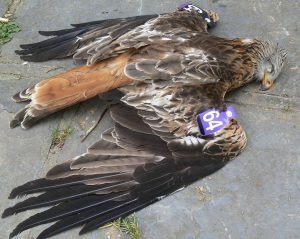 the bird is a road casualty, has hit wires, is under a wind turbine, etc) then it will be really helpful to send the corpse to the Predatory Bird Monitoring Scheme (PBMS), where it will be analysed for a range of environmental contaminants and toxins, as part of a long term study across UK. After contacting PBMS, they will send you a box containing what you will need to ship the bird to them. Once the analysis has been done they will be back in touch with the results. It’s all free. To contact PBMS, and to find out more about their work, visit their website here, or call 01524 595830.